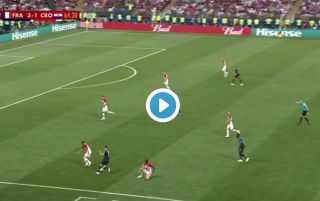 Kylian Mbappe scored an absolutely insane strike against Croatia this evening to all but wrap up the World Cup final for France. The PSG star’s strike mad it 4-1 to Les Bleus, with Mario Mandzukic scoring for Croatia just a few minutes later to make it 4-2. Despite the Juventus star’s fluky strike, Mbappe’s fine finish should see Didier Deschamps’ side claim their second ever World Cup title come 6pm this evening. The player now joins Pele as the only teenagers ever to score in a World Cup final. He’s definitely in good company!